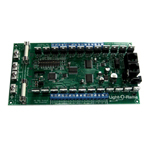 The Deluxe DC Board CMB24D is a 24 channel Direct Current Controller that can operate independently, operate as the director unit in a multi-controller network or as an add-on unit of a larger synchronized network of controllers. Each of the 24 independent channels has a number of special effects such as dimming, ramping, twinkle and shimmer. This card controls Direct Current (DC) loads. It has two 30 Amp DC inputs and can handle voltages up to 30VDC. Each channel is rated at 4 Amps. In the case the supply voltage is below 12 volts, an aux input is used to power the onboard electronics. This unit is an excellent choice for control of RGB LED Spotlights and Dumb RGB LED Strips with a common positive lead. The terminal strip is arranged in "+,R,G,B" groups for easy wiring of 4 wire RGB devices. The controller can be used on a LOR network or part of a DMX universe. Recommended for standalone and networked operation.